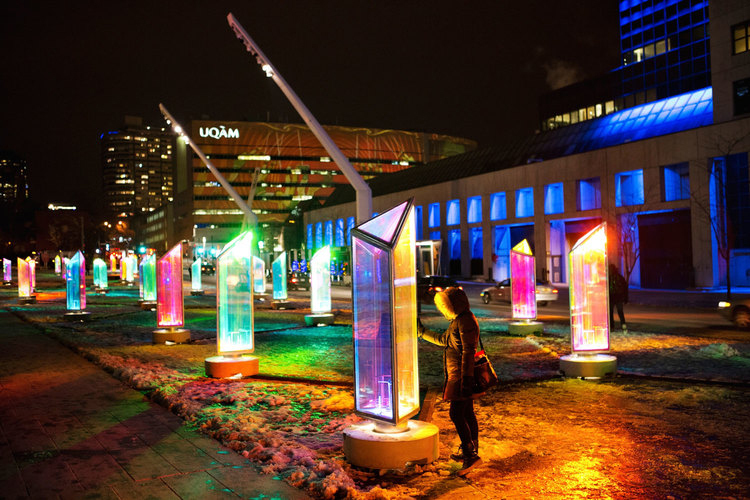 Toronto architecture firm RAW Design has the distinction of being the first organization outside of Quebec to take home the top prize in the prestigious Luminotherapie competition for 2014–2015. 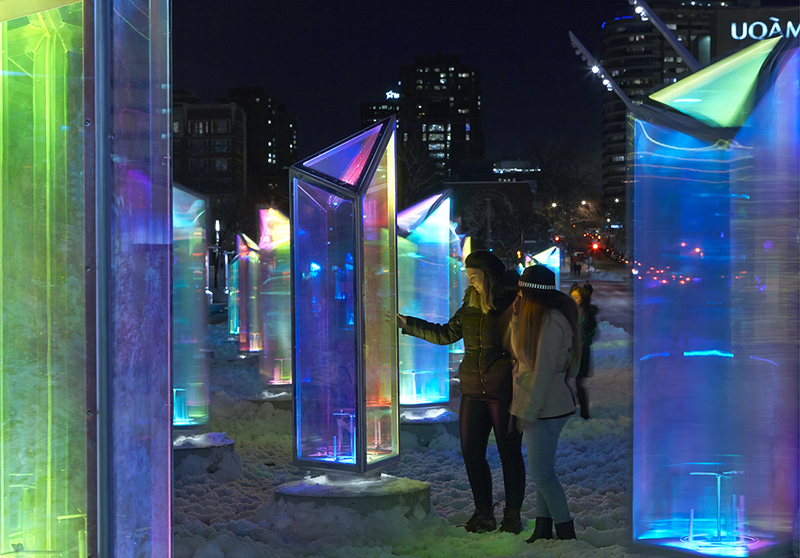 Using natural light during the day and illumination at night, RAW Design’s Prismatica display transformed Montreal’s Place de Festivals into an ice palace with 50 pivoting prisms, creating a kaleidoscopic effect. 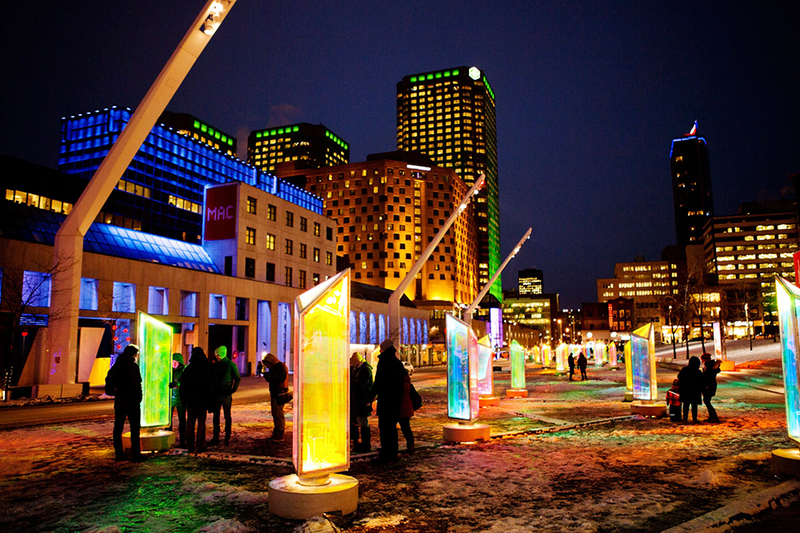 The project gave visitors the chance to wander along Quartier de Spectacles and see the area in a whole new light. 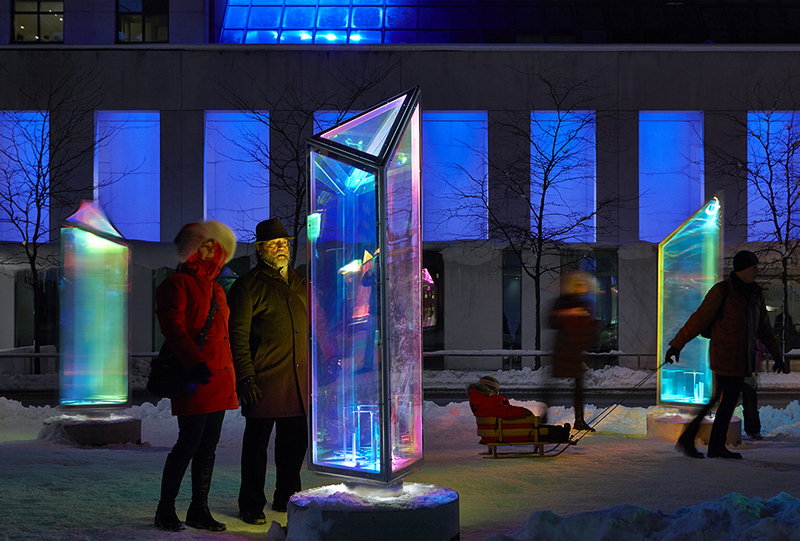 Viewers could spin the prisms to create mesmerizing colours; both with natural or artificial light. 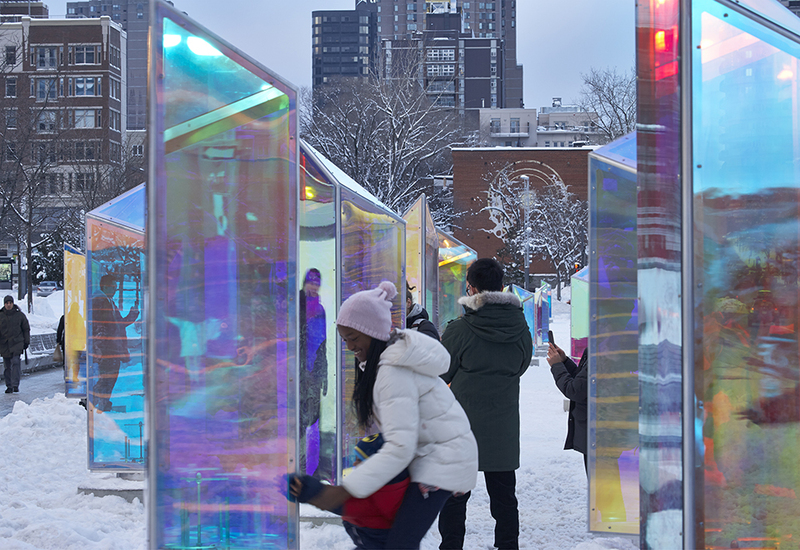 By using 3M Dichroic graphic film provided by Convenience Group Inc., RAW Design was able to create a project that stood out from the other unique entries. 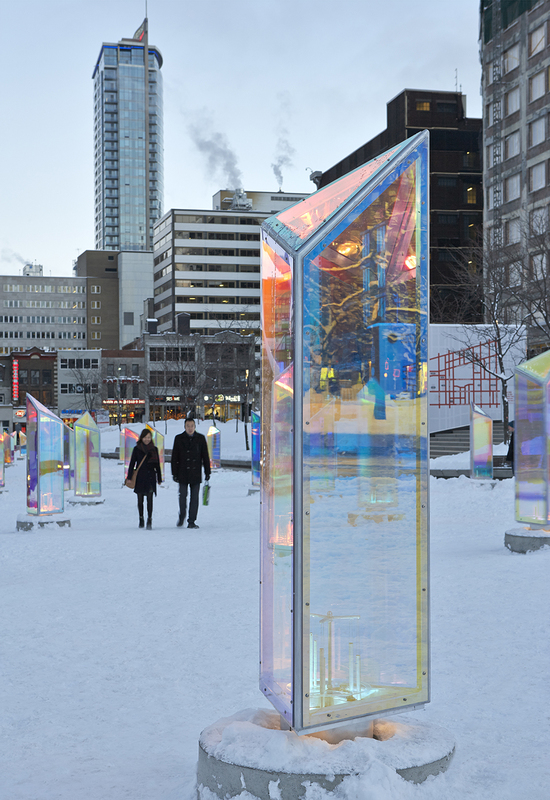 RAW Design came to us for the right material to use for the two-metre-tall prisms they were going to use for the project. We looked carefully at the effect they hoped to achieve and recommended 3M Dichroic graphic film to achieve the best results. 3M graphic film is popular with interior designers and architects, making it the logical choice for RAW Design to use on their prisms. 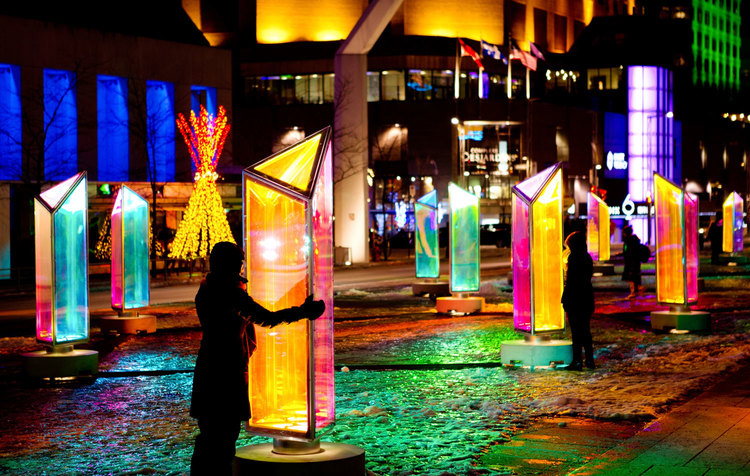 The prisms were mounted on bases that contained lights and chimes. Taking this into consideration, we advised them to use 3M's "Chill" and "Blaze" Dichroic graphic film which was cut and installed to their specifications. When they told us that they wanted to create a polychromatic light effect that would be accompanied by an ambient soundtrack, we knew this unique 3M film would meet their needs. 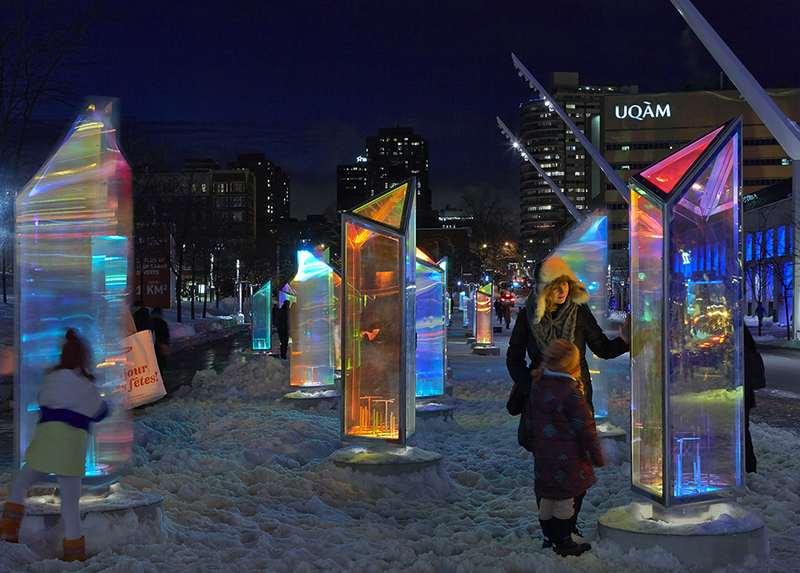 RAW Design took home the top prize and gave anyone walking through Quartier de Spectacles a unique experience. 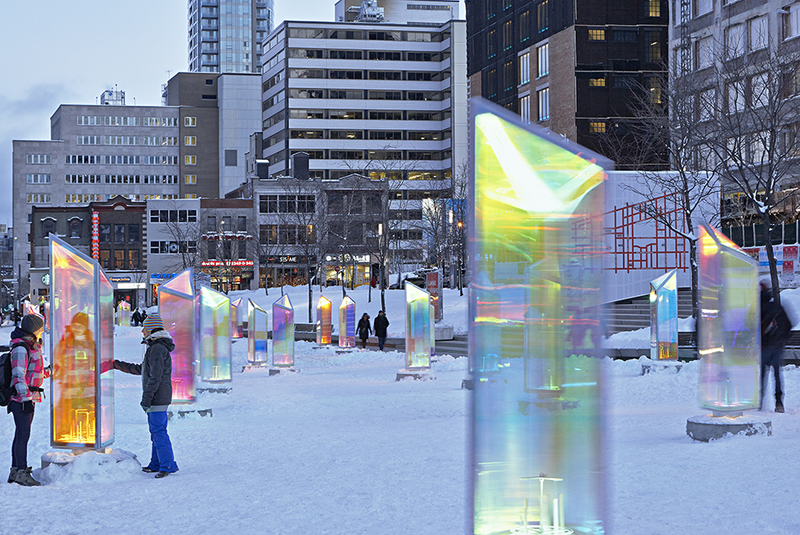 We realized that the 3M Dichroic graphic film for the prisms would need to be cut to a specific size. The film was applied to 200 polycarbonate panels, a cost effective and efficient substrate recommended by CGI. Using their exact measurements, Convenience Group Inc. provided films cut to the specific size that fit perfectly. 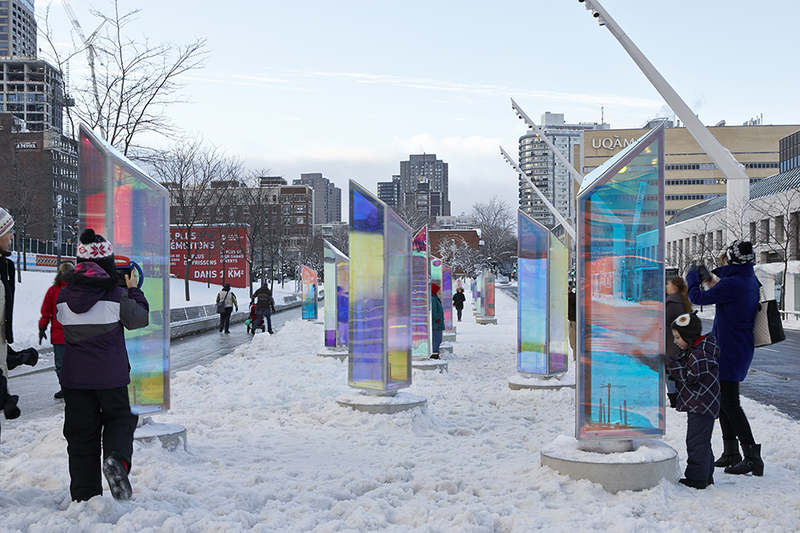 The panels were then shipped to Montréal where they were assembled into 50 prisms. RAW Design also needed material that would have the intended effect; as a leading expert and national distributor of 3M Window Films in Canada, we were again able to recommend the best 3M film to use for this very specific application. 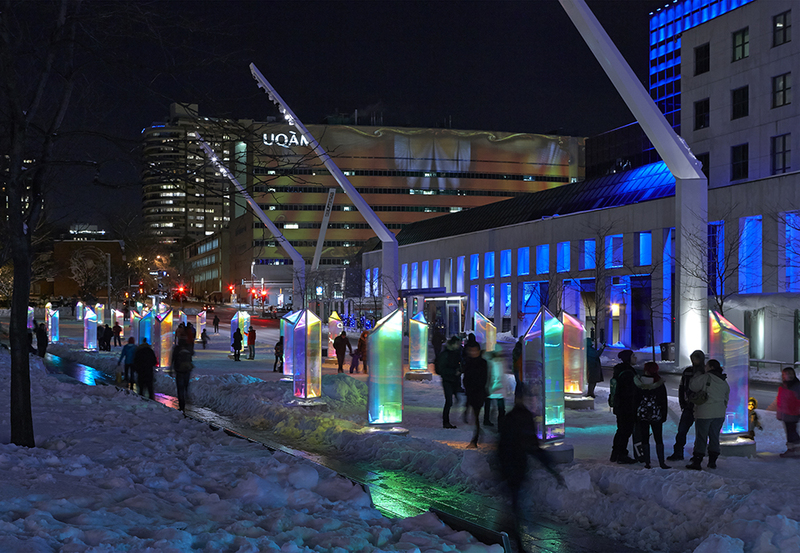 As pedestrians wandering along Quartier de Spectacles between December 10, 2014 and February 2, 2015 discovered, 3M products are extremely versatile, and with the proper lighting, created a spectacular and memorable effect that completely transformed the area. With over 40 years' experience, Convenience Group's team of in-house experts will install the films and ensure that the job is done properly. 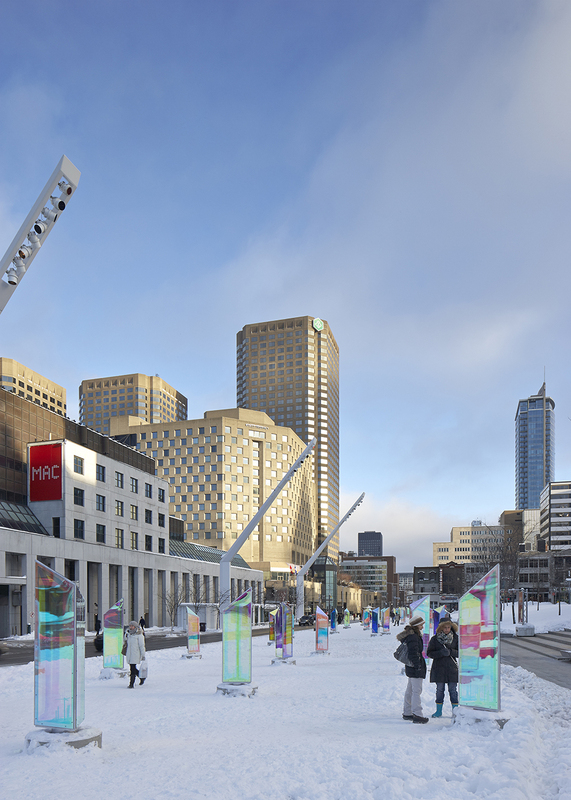 With the frigid temperatures that Eastern Canada experienced in early 2015, RAW Design wanted something that could handle the extreme cold; we use only superior quality 3M films that are engineered to stand up to the elements. If you need your project completed in a timely manner, such as RAW Design did in order to qualify for the competition, we are able to have 3M films cut and installed in an efficient and timely manner. When it comes to award-winning designs, we know how important quality control is. We respect this importance by offering strict installation compliance at our facilities in Toronto. Applying 3M films to glass is a cost-effective way to achieve the effects you’re looking for. Our team of experts will work closely with you every step of the way, providing advice, and experienced product recommendations to suit your specific application. 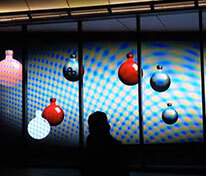 No two artistic or decorative film projects are alike; that’s why we offer our clients a virtually unlimited choice of custom patterns that we will manufacture to their specifications. For over 40 years, Convenience Group Inc. has provided clients with a wide variety of window films from 3M. Working with RAW Design, we have expanded our commercial and residential offerings to include customized films for design and large-format graphic projects. For over 40 years, we have provided a wide variety of clients with cutting-edge, innovative products, as well as expert consulting, design, and installation. 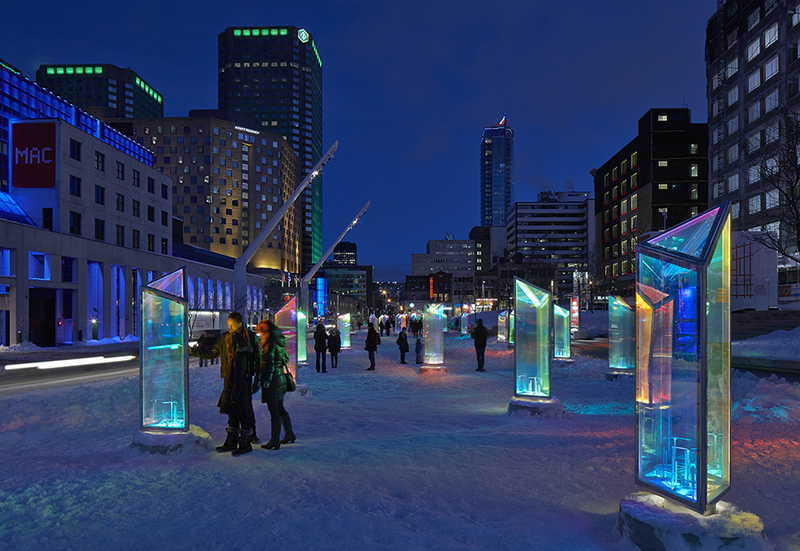 We used this experience to help RAW Design create their award-winning prisms for their entry in the Luminotherapie competition and become the first firm based outside Quebec to win the award. 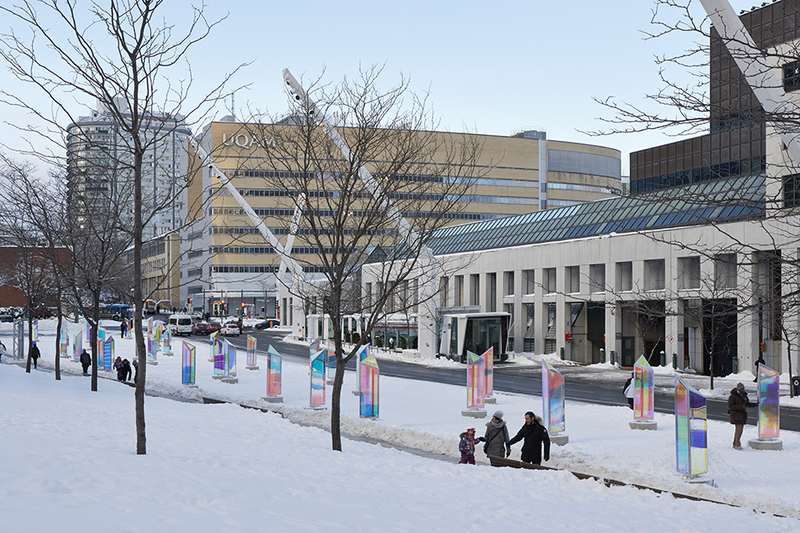 We installed the films on 50 prisms in an efficient manner so they were able to get the project to Montreal, install it, and get it up and running in plenty of time for the competition. RAW Design is just one of many leading property developers, engineers, architects, glass specialists, contractors and designers we have worked with over the course of our 40 year history. For more information on how we can help your business, contact Convenience Group today!